Atomicite Profonde Poetry - Paulette Marie Sauve fine art, mixed media paintings, and weaves tapestry. The title of this artwork is Atomicite Profonde Poetry. I originally painted this in 1989 while beginning the first year of my university studies for a Master of Fine Arts degree (awarded in 1992). After working mainly in photography and silkscreen techniques, I decided to go back to my earlier paintings. I continued to work on this painting and added the sketch of the bridge. This was one of my major pieces of a solo show in 2015. 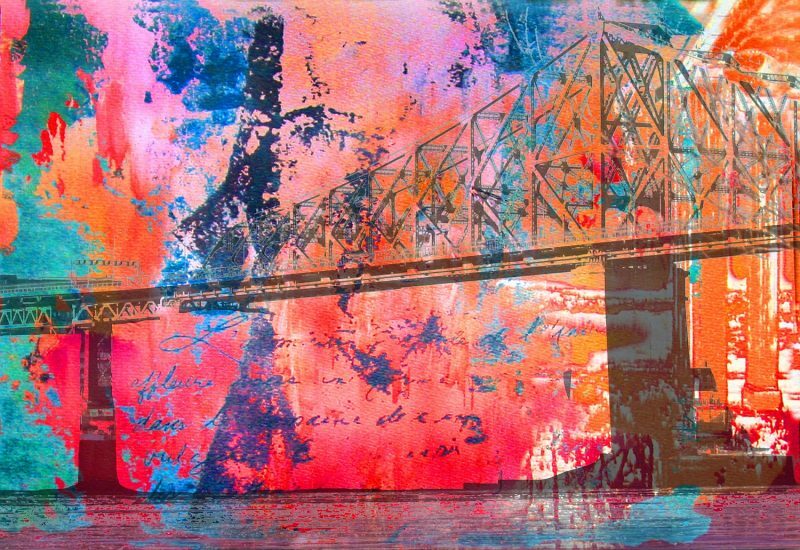 The theme represents Poetry in a cityscape, with lovely and vibrant colors, such as: Coral, fuchsia, dark turquoise and charcoal. This work is framed and the dimensions are 49 inches wide by 33 high. The medium is acrylic and ink on aluminum, the frame is made of wood, and this work is ready to be installed.